To collaborate in a classroom using mobile phones needs a projection of a media that allows multiple users to see what is happening on the entire document. 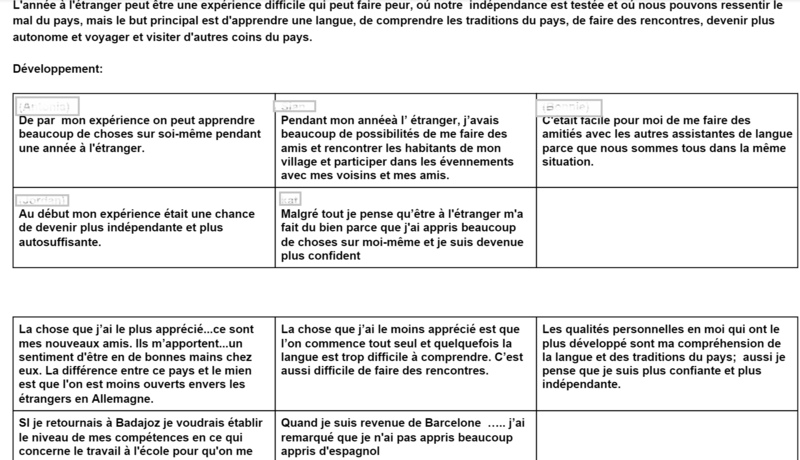 This year I’m teaching French Essay writing in small groups of up to 10 students so I had the opportunity to test this. Admittedly you need to have students connect to the school’s/ University’s wireless network BEFORE the class takes place since phone providers’ networks vary in strength. Perhaps other programs provide the same function for having students collaborate simultaneously on a document, though I have not ventured out of Google Documents since they have not let me down so far. The MOST IMPORTANT thing to remember is to create a table in the shared document so that multiple editing doesn’t end-up with all participants fighting at the flashing cursor point. Instead they can all be ascribed a cell within the table. I was not expecting collaboration using phones to work necessarily, so I just created a new document on the fly at the multi-media podium and projected it onto the screen in front of the traditionally set-out classroom. 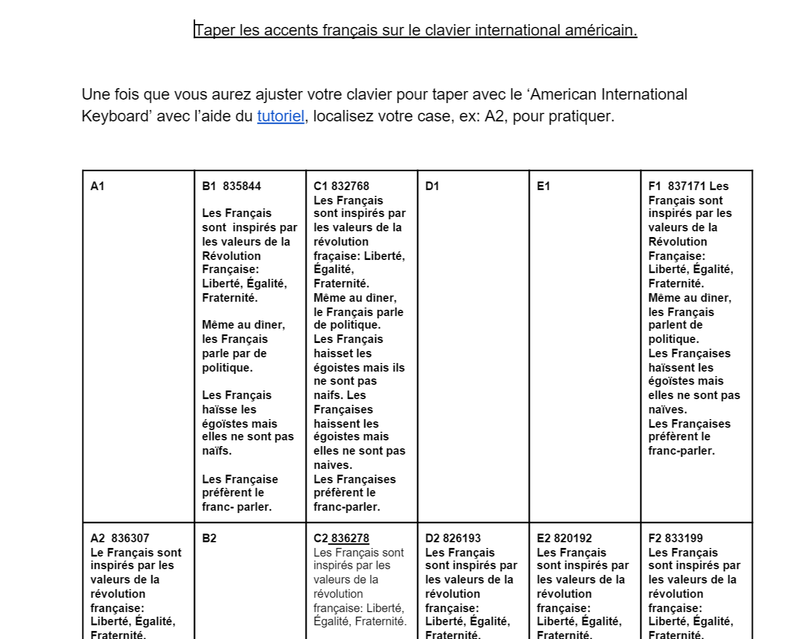 Having clicked the ‘Share’ button I then asked each student (in the target language), to volunteer an email address where the ‘Share’ could be accessed, having set the Sharing options to ‘All those with the link can…’ ‘Edit’. The results were much better than my initial suspension of judgement might have warranted, with 90% of students managing to connect. In the case of a student not being able to connect, I invited them to write at the podium, which in a way produces movement and enables me to talk to students individually about their work. The result of this method is that a collective as well as individual oral input into students’ answers is generated, and spelling or grammar (for the most part) can be corrected synchronously. The activity that required the most participation and class interaction came last, almost as an afterthought. 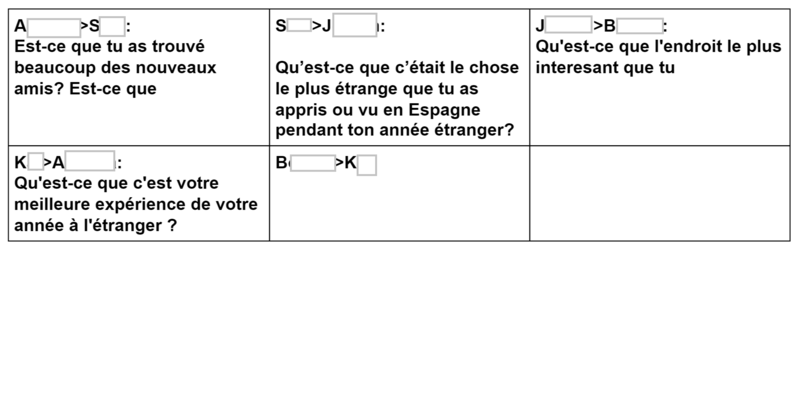 In the last few minutes I had the students ask each other questions about each others’ Year Abroad using the shared document. They were ‘saved by the bell’ on this occasion, though you may see by the results below that a promising start had been made. Next year I’ll remember to do this exercise first earlier in the class, since it could possibly generate more spontaneous replies. Students asking each other questions on Google documents (uncorrected). Whilst I would not make this sort of participation via mobile phones mandatory, and because the novelty does wear-off after a while, students now bring more capable mobile devices to these classes, such as laptops or tablets. To be honest, writing on a phone in a large document can be disorienting because you cannot see the whole of the document, although this is remedied in part by having the projection of the document on the classroom’s screen. Whilst this sort of interaction via mobile devices is in its inception it has wielded many positives and some unexpected results. With students coming equipped with devices that have larger screens, such as tablets or small laptops, I can see that they probably value being able to keep noting the points we are developing, as well as getting corrections. One of the more surprising results for me is that rather than alienating students; with each potentially immersed on their own mobile device, this form of conducting a class brings students together as they can both see and hear the points being referred to in each others’ work. Whilst answering a question about another’s work, they can use what has been inputted on the document to help them produce their own oral response. Altogether I find this method far more productive than the traditional Oral Language class, where students can feel pressure to respond spontaneously, because they don’t have a written support to lean on. 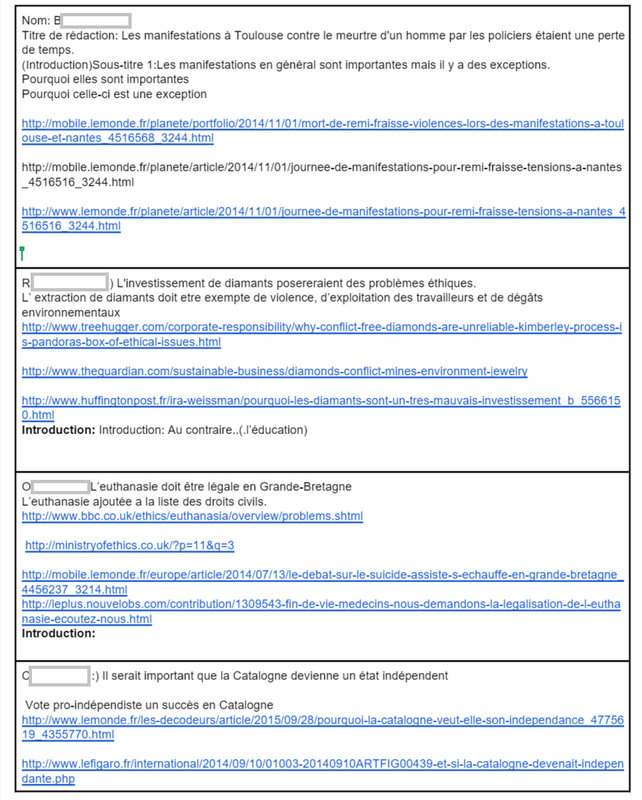 The benefit of the Shared document is that it provides optional input, can be used by the instructor as a blackboard, and importantly provides a record of notes for use after the class.